The basic design of the incandescent lamp has not changed much since the late 1800s, when Thomas Alva Edison successfully produced the fist operational electric light bulb. The filament inside an incandescent lamp must be protected so that oxygen does not reach it and cause it to evaporate on contact. Most incandescent lamps are either vacuum-sealed or gas-filled. Incandescent lamp filaments are made of tungsten. Tungsten is a metal that can operate at very high temperatures without evaporating too quickly an resulting in early lamp failure. Incandescent filaments only convert about 10 percent of the energy used into visible light, so it is necessary to use a material that can withstand extremely high temperatures. Most lamps use a coiled filament design, which has been found to be stronger and deliver better performance. The basic design of the incandescent lamp has not changed much since the late 1800s, when Thomas Alva Edison successfully produced the fist operational electric light bulb. The filament inside an incandescent lamp must be protected so that oxygen does not reach it and cause it to evaporate on contact. Most incandescent lamps are either vacuum-sealed or gas-filled. Incandescent lamp filaments are made of tungsten. Tungsten is a metal that can operate at very high temperatures without evaporating too quickly an resulting in early lamp failure. Incandescent filaments only convert about 10-Percent of the energy used into visible light, so it is necessary to use a material that can withstand extremely high temperatures. Most lamps use a coiled filament design, which has been found to be stronger and deliver better performance. GE 21079 Basic General Purpose Mogul Base Ps35 300-Watt 21079 - 300/IF GE PS35 Bulb PS35 Base: Mogul Screw (E39), Wattage: 300 Voltage 130 Initial Lumens 5820, Rated Life: 1000 hours, Product Code: 21079, Description: 300/IF, UPC: 043168210799. The Primary Application: Standard . GE incandescent lamps represents the state of the art of lamps for residential and commercial use, as well as special purpose lamps for decorative or display applications. In an incandescent lamp, light is generated by heating the filament to incandescence. The hotter the filament, the more efficient it is in converting electricity to light. However, when the filament operates hotter, its life is shortened so the design of each lamp is a balance between efficiency and life. This is why lamps of equal wattage may have different lumen ratings and different life ratings. 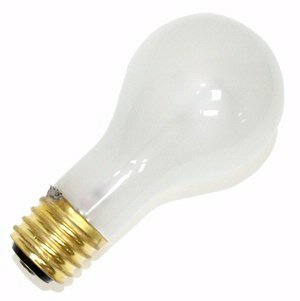 Incandescent lamps of similar size are commonly available with different wattage ratings. The fixture wattage limit should not be exceeded. For product questions regarding GE Lighting products, please call GE Hotline 1-800-435-4448, Monday – Friday, 8:00 a.m. - 6:00 p.m. EST Follow the recording prompts or ‘stay on the line’ to speak directly to a customer service rep.
30 Watt Commercial Grade LED CORN LIGHT BULB E39 Mogul Base - HID/HPS Replacement An efficient, unique design offering 360° seamless illumination. PRODUCT SPECIFICATIONS: LED Type: High Power SMD2835 LM-79 LM-80 Color Temperature: Natural White 5000K CRI Rating: >80 Luminous Flux: 3,450 lm. Integral Driver with 4.5kv Surge Protection Input Voltage: 100-277V AC 50-60Hz AC Draw: (0.26A @ 115V) (0.14A @ 220V) (0.11A @ 277V) Power Consumption: 30 Watt Operating Temperature: -4° to +113°F Advanced Passive Aluminum Heatsink for Superior Heat Dissipation 50,000 hours LED Lifespan No UV or IR radiation, no mercury or other hazardous materials. UL/cUL, DLC, CE, RoHS Certified, IP64 Product Dimensions: 9-1/16" x 3-11/16'' (L x Dia.) Package Weight: 1.30 lbs. Applications: Post Lights, Studio Lighting, Security Lighting, High Bay Lighting, Streets and Parking Areas, Etc. Estimated Electric Bill Savings* $39.31 per year *Based on comparison to HPS/MH Fixture. At $0.12/kWh and 12 runtime hours per day, 365 days per year. AMAZON Protected Money-Back Satisfaction Guaranteed. 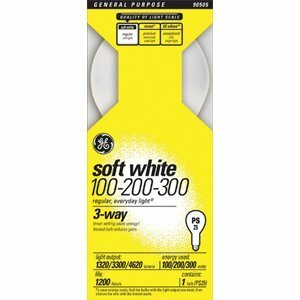 GE soft white 3-way 100 to 200 to 300 watt A21 frosted mogul base general purpose light bulbs illuminate your home with soft, pleasing light. 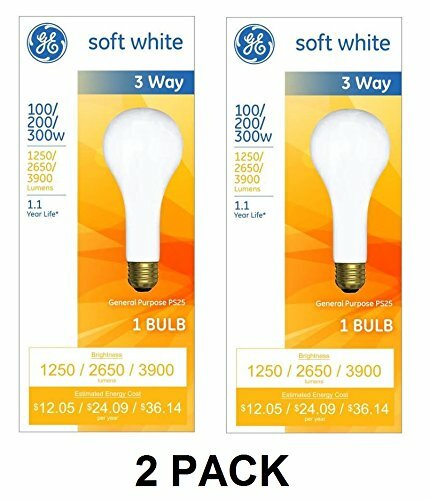 This GE soft white general purpose light bulb is rated to last 1.1 years based on 3 hours per day use. Designed to work with 3-way sockets, select the first setting for low mood lighting, the second setting for general purpose lighting and the third setting for task lighting. 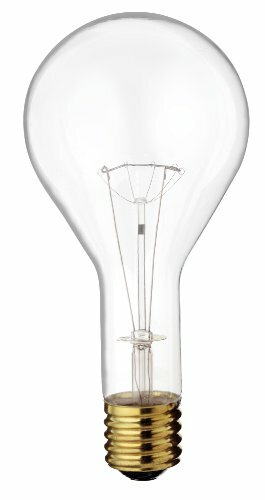 Use this incandescent light bulb with a mogul base in indoor table lamps with 3-way mogul sockets. Compare prices on 300w Mogul Base at Shopsimal.com – use promo codes and coupons for best offers and deals. We work hard to get you amazing deals and collect all avail hot offers online and represent it in one place for the customers. Now our visitors can leverage benefits of big brands and heavy discounts available for that day and for famous brands.